☂ PREVENT HEAT:Each is attached is a long handle to prevent you from feeling the intense heat of the grill. ☂ ALUMINUM CASE:Aluminum case is included to protect these accessories. It also makes it easy to store and carry with you for any occasion or trip. ☂ PREMIUM STAINLESS STEEL:It\'s make of premium stainless steel which will not contaminate your food, rust, crack, deteriorate, matches everything, doesn\'t stain easily, and is easy to clean. ☂ MEET YOUR NEEDS:Almost every tool you need for barbecue is in this case. 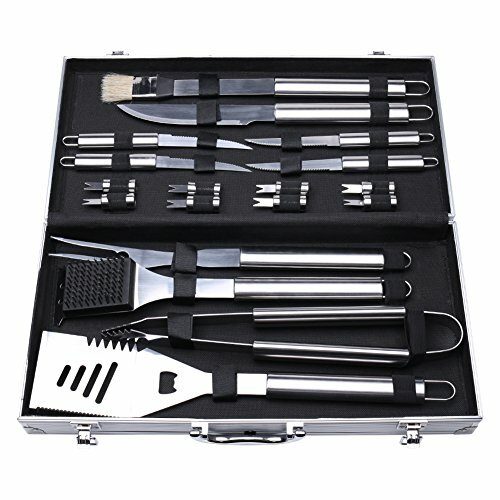 4-in-1 spatula,fork,knife,grill brush,basting brush,skewers,forks and so on. ☂ QUALITY WARRANTY: If you\'re not happy we\'re not happy! If we can\'t make it right and you are not satisfied for any reason,we will gladly and promptly refund your purchase price.